Spring. When a young man’s fancy turns to love and a middle-aged woman’s turns to gardening ( all those jobs which need doing… ). 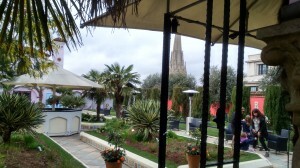 But not yesterday when, for the first time, I explored the Kensington Roof Gardens. A stone’s throw from the tube at Kensington High Street, the entrance to the roof gardens, at number 99, Kensington High Street, is actually just around the corner in Derby Street. There a lift takes you to the sixth floor and another world. 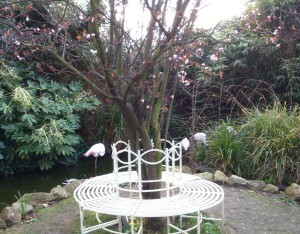 Turn right out of the vestibule door and, across the English flower garden, the pink of the cherry blossom vies with that of the flamingos as ducks and geese swim on the little ‘stream’ beneath the Chinese bridge. Turn left and you are in an Alhambran garden, complete with pruned cypresses, a rusticated colonnade with seating for when the weather is more Guildford than Granada and a remarkable view of the spire of St Mary Abbots just across the High Street. Continue round and you walk through a series of English Tudor garden rooms, complete with flowering urns, honeysuckle and tudor roses. Originally built as part of Derry and Toms department store, the grade 2 listed gardens, stretching over 1.5 acres, were designed by landscape architect, Ralph Hancock. They took two years and £25,000 to build, during 1936 and 1938. Several of the original trees remain in situ. 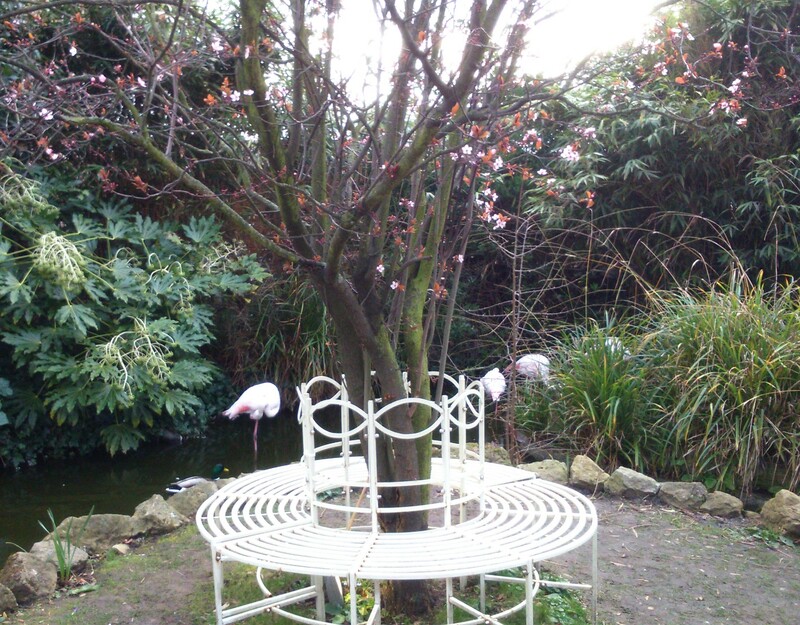 Today they are open to the public on a regular basis, but the pavilion within the gardens is often used for functions and events, so it’s best to call ahead to see if they will be open when you want to visit ( 0207 937 7994 ). 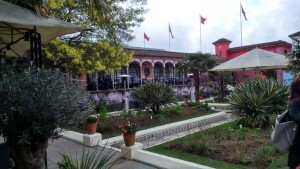 A gardening club is popular and costs £25 to join. Entrance is, however, entirely free and there are outdoor heaters at this time of year. 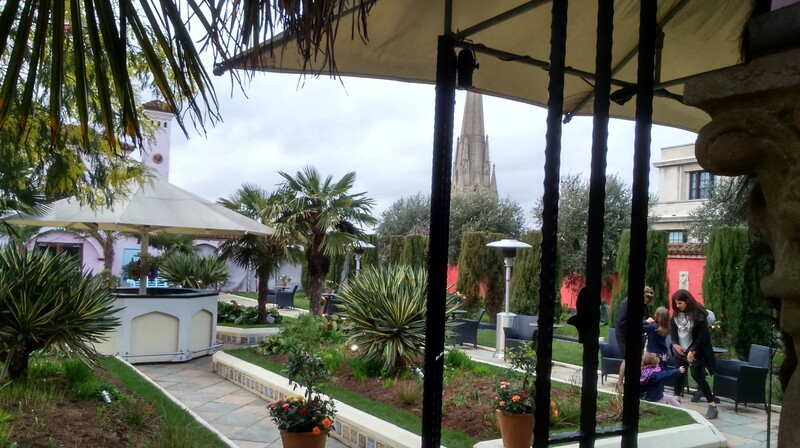 There is a restaurant on the 7th floor which overlooks the gardens and has spectacular views over London ( and a three course Sunday lunch can be had for £30 per person ). All are now owned by the Virgin group and more information can be found on their web-site. More photographs can be found on Pinterest under juliej.